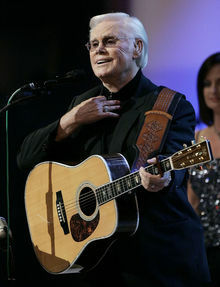 NASHVILLE, Tennessee (AP) — George Jones, the peerless, hard-living country singer who recorded dozens of hits about good times and regrets and peaked with the heartbreaking classic "He Stopped Loving Her Today," has died. He was 81. His drug and alcohol abuse grew worse in the late '70s, and Jones had to file for bankruptcy in 1978. A manager had started him on cocaine, hoping to counteract his boozy, lethargic performances, and Jones was eventually arrested in Jackson, Mississippi, in 1983 on cocaine possession charges. He agreed to perform a benefit concert and was sentenced to six months probation. In his memoir, "Satan is Real," Charlie Louvin recounts being offered a fistful of cocaine by Jones backstage at a concert. NASHVILLE, Tennessee (AP) — A public funeral will be held at the Grand Ole Opry House in Nashville for country music superstar George Jones, who died Friday at the age of 81.